Updated: Dec. 10, 2018, 2:45 p.m.
It’s that time of year again. The beginning of school has past, pumpkin spice everything is pumping through our veins, and the mounds of candy are stacking up for the back to back holiday events in the future months. Halloween kicks off the sugar highs that last through Feb. 14. As a child, Halloween was a favorite holiday. I would make a decision about my costume in September and there were no changes. My mother would collect the needed items and start sewing. She had a deadline for mine and my sister’s Halloween costumes. If she was lucky, she could find a pattern! Once started, there was no turning back. We would stand still while hems were pinned, hats fitted, a tail fixed correctly so it wouldn’t end up on a cheek! One night to wear it, one night to fill my pillow case with as much candy as possible, one night to walk from house to house and work for the best candy possible. After what felt like 20 miles on our feet, my sister and I would sort through our candy and start making trades. Fast forward 20 years (who’s counting) some dangerous scares, and sicko tricks people pulled; now we have trunk or treats, caravans, golf carts and mall trick or treating. Although I understand the fear parents experienced, the pendulum has swung so far in the other direction we can’t keep up. 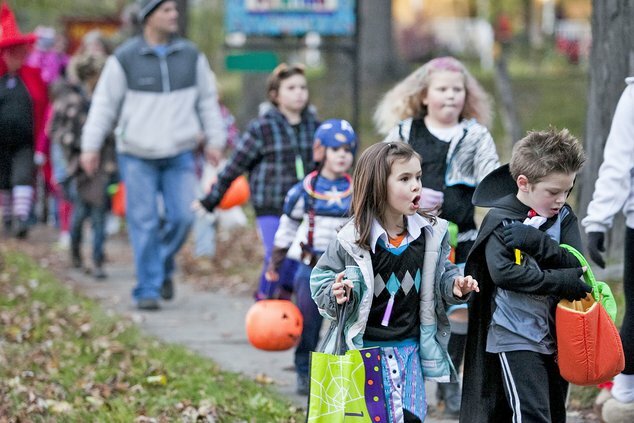 Halloween seems to start three weeks in advance with trick or treating community events. Open trunks line up 2 feet apart decorated with a variety of themes, luring children to wait in line, get a piece of candy, shuffle 2 feet to the next trunk, and so on. Costumes must be purchased well in advance in order to make all the events throughout the month of October! And the decisions! There have been a couple years where costume changes were normal from one event to another! I put a stop to that. Choose your character, monster, villain, princess and we are done! That backfired…… I’m a sucker for costumes; this is one of my favorite holidays. I would order and then return, buy and then exchange when a better one is found. I have a great time painting faces, staining clothing for the zombie apocalypse and morphing my beautiful son into a scary clown! And the candy! The obscene amounts of candy given out, not just one night, but over a course of the entire month, enticed many arguments each evening. My son has lost most interest in candy and just wants to scare other little kids. My daughter, on the other hand, has a primal obsession with her Halloween candy. Week after week leading to the main event, the children get candy. It feels like there is no stopping the sugar highs and lows through the month of October! A couple years ago, I brought it to an end. We decided on one other event, and then Halloween night. We go around in our neighborhood and walk from house to house. If my kids are not willing to walk, no treats! I’m still a sucker for homemade costumes so I bend when it comes to black cat at one event and then a ghost girl for Halloween night, but we’ve reduced the amount of sugar collected and the cost of buying costumes. Sometimes I even recruit Grandma and an old pattern!